Surrounded by the ocean on all sides, boats have always been a necessity for the people on the islands of Okinawa. Okinawa prospered as a maritime state in its past as the Kingdom of the Ryukyus, with its people traveling the seas and engaging in trade with China and various Southeast Asian countries. When supplies were scarce before and after the Battle of Okinawa, fishermen used natural materials such as wood, stones, and bamboo to create necessary fishing tools and made innovative adjustments with things from their daily lives. One of them was the invention of the original Mikagan or underwater goggles, which greatly advanced the culture of the Uminchu, or the seafarers. With their fishing nets, too, fishermen reportedly coated the nets with pigs’ blood, as the fish would not go near white cotton nets, and which also prevented the nets from decomposing from the saltwater. 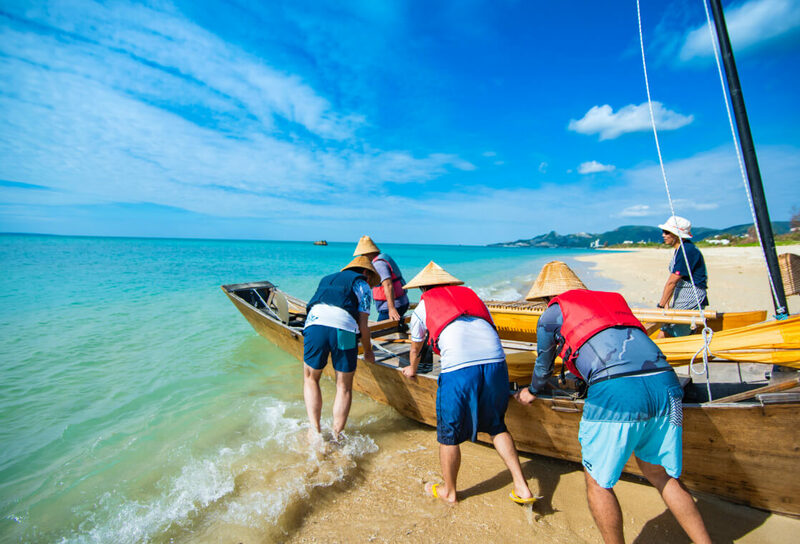 The Sabani boat-building techniques, fishing methods, and other great wisdom of the seafaring forefathers paved the way to a maritime culture that is truly unique to Okinawa. The Sabani was commonly used for fishing and transporting daily goods to various locations, and was a necessity for the fishermen on Okinawa. Not a single iron nail is used in the building of Sabani, but they are sturdy and solid, put together by wooden and bamboo nails. The highly functional features are also remarkable; the thicker bottoms and the thinner sides allow fishing nets to be pulled on to the boats with ease. Improvements have been made over its history, such as applying shark liver oil on the bottoms to prevent decay. 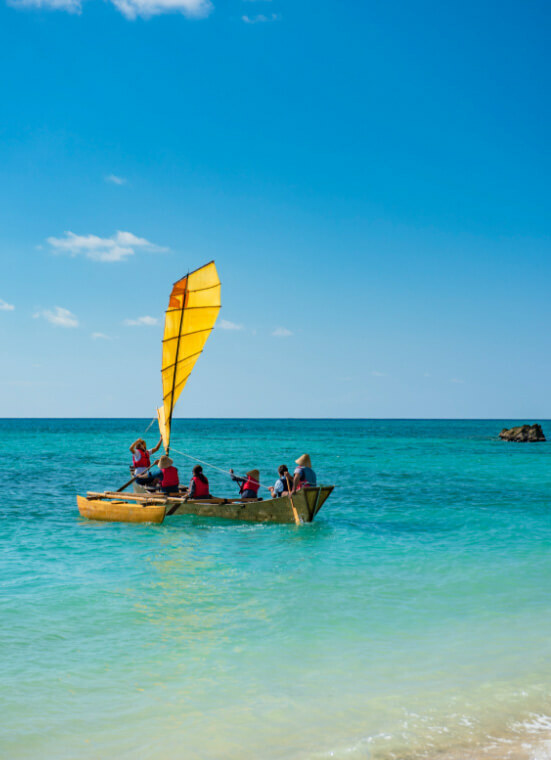 On these Sabani boats, the Okinawan fishermen set out to the great seas and travelled between the islands. One of the keys to understand Okinawan culture. Charmed by the spirit of Okinawa, Daniel López works as a bridge to invite the world to learn and understand the culture and traditions of Okinawa through his art. 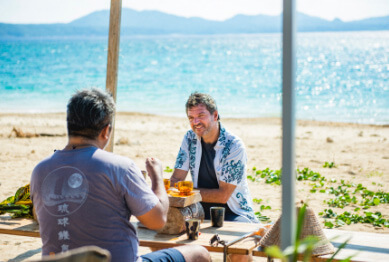 In his first full-length documentary, Katabui – In the Heart of Okinawa – which was released in 2016, Daniel captures the spiritual strength in the ordinary, everyday life on Okinawa, as people live deeply connected to the distinctive traditions of these islands. “I wanted to tell people around the world about the way of life of the Okinawans – so connected to nature.” As Daniel López worked in the tourism industry in Switzerland, he was able to travel wherever his heart took him, always with his camera at hand. He left his work and home and set out on a real journey at the age of 30. “As soon as I arrived on Okinawa, I thought, ‘I could live here.’ I went to so many places, across Europe, America, and Asia, and met so many people, but I’d never felt that way before.” Daniel López followed his inspiration and relocated to Okinawa a year later. 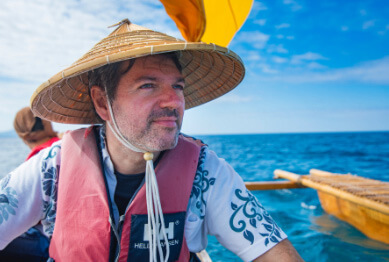 On a beautiful beach along the Nago Bay in northern Okinawa, Daniel López met with the Yanbaru Haruser Team and joined them on his first Sabani sailboat experience. Although the Sabani is a traditional fishing boat that supported the lives of the Okinawan people for generations, after the Second World War, boat engines became readily available and the number of Sabani quickly dwindled. In seeing the Sabani boat-building and navigating skills becoming lost, people got together to find ways to bring back the Sabani. In the year 2000, the first Sabani Sail & Paddle Race took place, racing a distance of approximately 35 kilometers from Zamami Island to Naha. 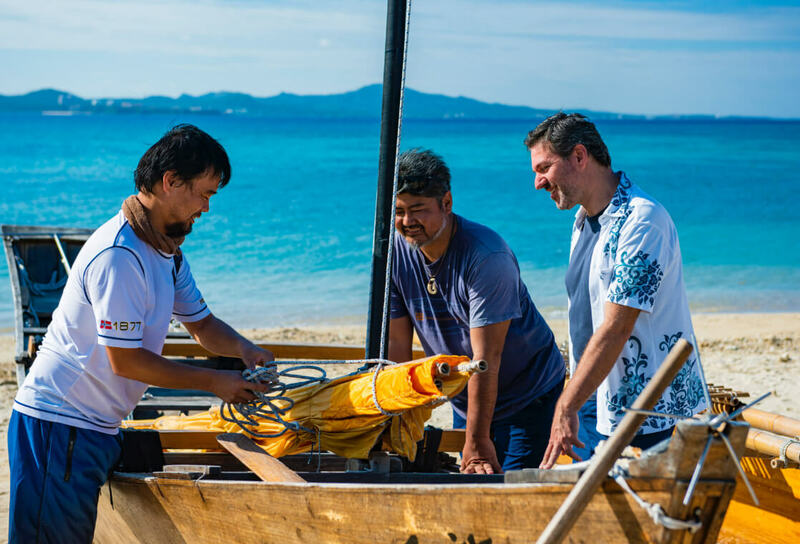 The launch of the annual race event, in part, brought about the succession of techniques from a handful of Sabani boat builders to the next generations, and the Sabani culture is now on track for revival. 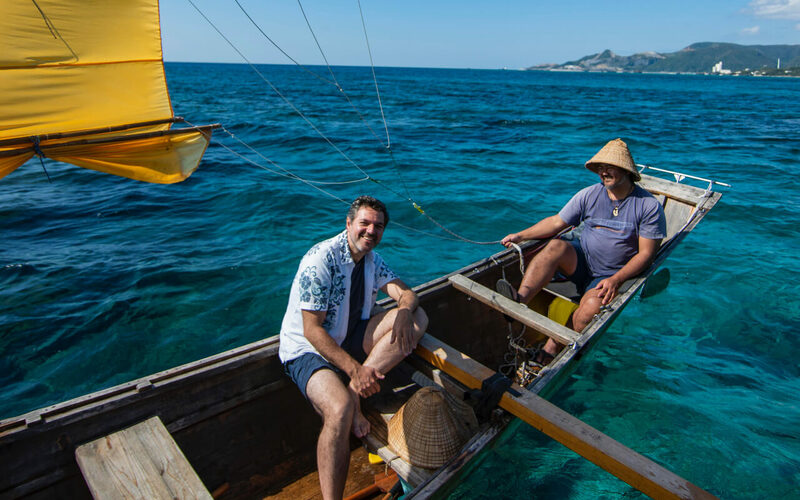 The Sabani sailboat experience is navigated by the men of the seas that are the driving force behind the revival of the Sabani, and each authentic tour offers different excitement depending on the day’s weather and sea conditions. 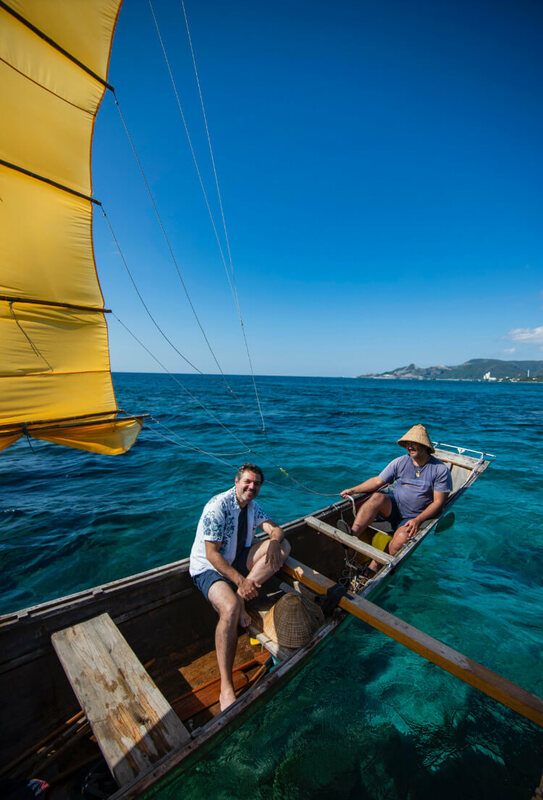 The Sabani uses wind power to sail just like a yacht, but also with paddles called Ueku. With six to eight people on the boat, the captain skillfully reads the winds and tides to steer, and from his position at the tail of the boat, he calls out directions for all on the Sabani to row in unison. The Sabani seemed to glided on the waters in great speed when the winds began to blow and the sails were set. When the wind was sufficient, it allowed those on board to sit back and enjoy the sailing, and when the winds ceased, the Ueku paddles pushed the boat forward. Surrounded only by the sounds of the wind and waves and no rumbling of engines, it was a very special experience to feel the courage and spirit of the fishermen from the bygone era, and becoming one with the great open seas. 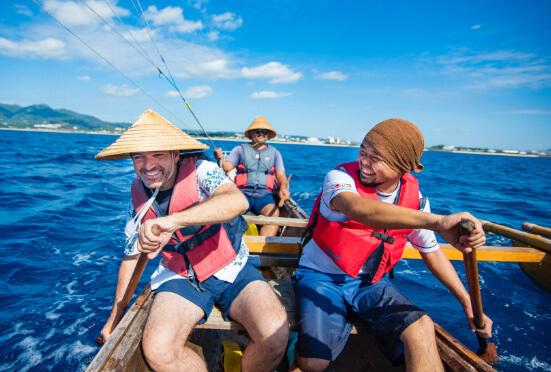 Take a ride on a Sabani to experience a unique maritime culture and feel the history and tradition that links the past to the future of Okinawa. A team made up of local experts in various fields offer their knowledge and expertise for grownups to enjoy playing outdoors. With their suggestions and ideas, you can customize a very special experience you won’t soon forget. The exuberant Sabani experience on the waters of Nago is about 1.5 hours long, where you can experience a unique marine activity that’s deeply rooted in the local history and culture. 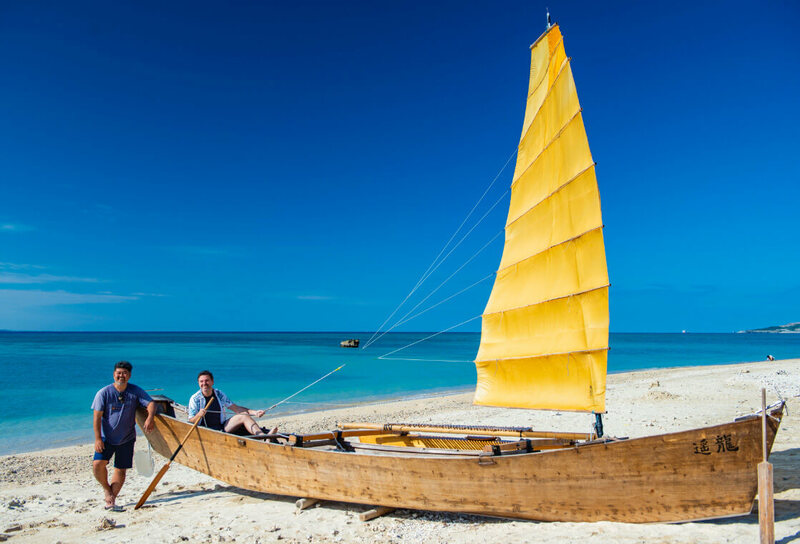 Their love for this region inspires other fantastic experiences besides Sabani sailing, like beach picnics and much more. Enjoy Okinawa and the Yanbaru area with all your five senses and make memories that you’ll cherish forever. Daniel López is a Spanish-Swiss filmmaker and photographer who relocated to Okinawa in 2003. He made his filmmaking debut with his full-length documentary, Katabui -In the Heart of Okinawa-. The documentary was highly acclaimed in Germany and Taiwan, and was a long running film in Switzerland and Okinawa. Seifu Gama You’ll often see works of pottery in various places on Okinawa. Pottery is known as Yachimun in the local language, and many are motifs of fish, leaves, and other natural things. 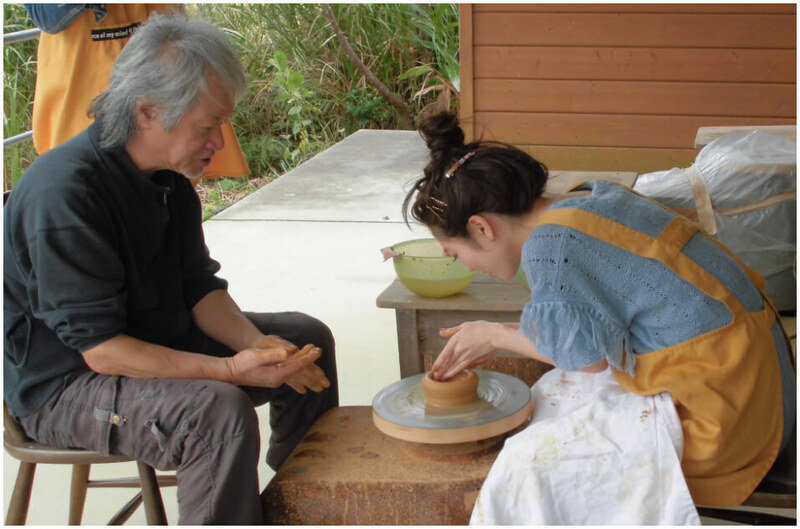 Why not create your very own traditional Okinawan Yachimun piece while you’re here? Zuisen Distillery Co., Ltd. Awamori is made with malted rice from black Koji mold, and is said to be the oldest distilled liquor in Japan. Those that have been aged for over three years is called Kusu, and is a must-try while you’re in Okinawa. 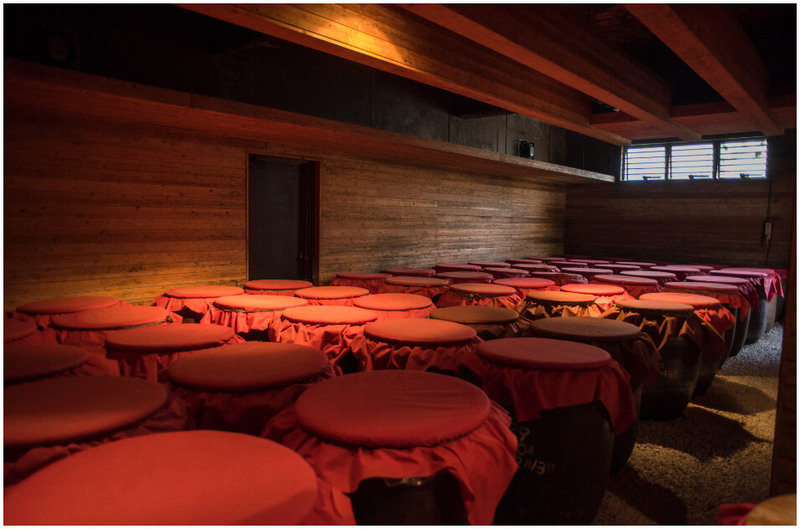 See the traditional methods of Awamori production and discover its allure. Uruma City Bullfighting (Ishikawa Dome) Bullfighting in Okinawa is unique and comparatively more peaceful, where two bulls lock their horns and test their strengths. With Bullfight Waido superhero as its mascot, Okinawan bullfights have been garnering popularity once again especially in Uruma City, where the tradition still remains to be a big part of the local culture. 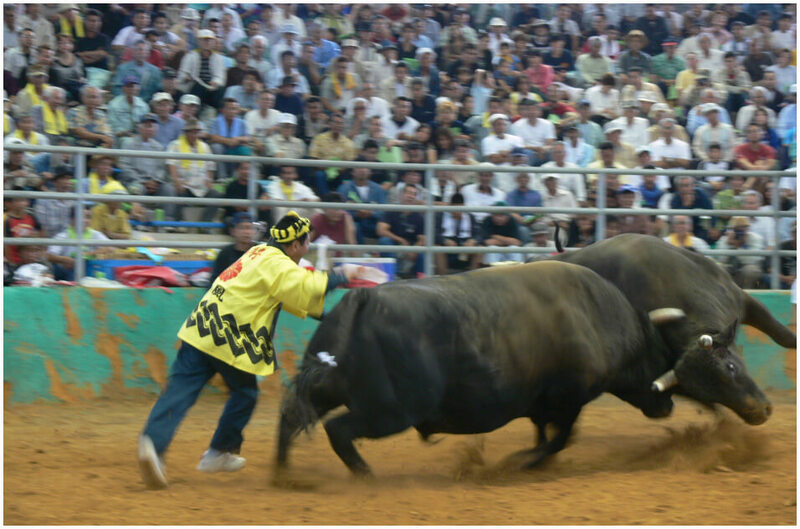 There are over 20 bullfighting tournaments throughout the year for people to enjoy. 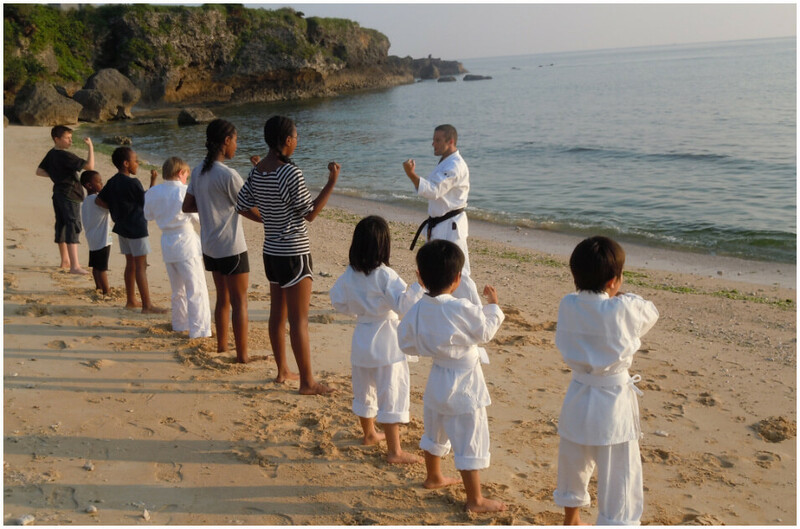 The Okinawa International Karate Study Centre Learn traditional Karate in a dojo erected along the recreated streets from the era of the Ryukyu Kingdom. Learn the basics of Karate and its spirit through the teachings of three schools: Shorin Ryu, Goju Ryu, and Uechi Ryu. 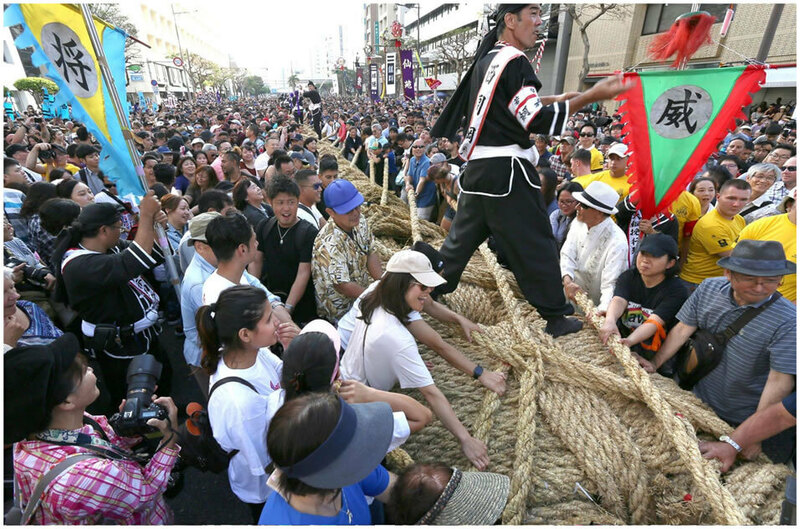 Naha Giant Tug-of-War Among the traditional events passed down the generations for centuries, the Naha Giant Tug-of-War boasts a long history that dates back to over 500 years. The giant rope weighs 40 metric tons, has a length of 200 meters, and is listed in the Guinness Book of World Records as the largest rope. Join the crowds of 15,000 people pulling the rope for an experience you’ll never forget.